Definition. Hope is a word that has multiple definitions and is used in various ways by different people. Hope is a tentative conclusion – I hope I get money back on my tax return. But hope is also a posture toward the future – I am hopeful about the job market. She is a hopeful kind of person describes a person who is optimistic. Waiting outside the operating room, the husband is asked – Are you hopeful about your wife’s surgery? – inviting him to express an inner conviction. Hope-lessness. Whatever way we would like to define hope, we have all been in organizations where its lack is palpable. We have seen leaders who do not embody hope so they do not embolden those who follow. Being more negative and pessimistic, these leaders without hope become easily absorbed with challenges and preoccupied by obstacles, so that it becomes contagious and infuses the communal climate. Eventually the entire system is hope-less and whatever service the organization has to offer it is tainted by a lack of confidence. Interestingly this transmission of hope-lessness weaves its way through the enterprise in such a way that those who participate have lost sight of the fact that there is no conveyance of hope. SCSBC schools run the same risks. Officer managers, financial officers, department heads, vice-principals, principals, superintendents, board committee chairs, and board chairs all set a tone on the subject of hope. A climate of hope-lessness in the school community can often be traced to anxious leadership that lacks hope and cannot see beyond negative circumstances. I would suggest leaders would do well to engage in some healthy self-examination, aided by others, to ascertain the presence or absence of hope in their personal mood, strategic direction, and biblical orientation. Personal Mood. Our emotional tone as leaders is expressed in multiple ways, through our facial expressions, words, turns of phrase, humour, and body movements. It is fascinating how quickly we can pick up whether a leader experiences and expresses a hopeful mood in the work of the school, or whether she brings negativity and pessimism. However, if we misconstrue a hopeful mood as superficial optimism or a cheerful smile, we will be read by our communities as lacking genuineness or authenticity. Ironically we will not be seen as people of hope but more as those who are working hard to be positive with a covert denial of life as it is. In contrast, a hopeful mood is characterized by realism and truth telling where we are able to fully incorporate the way it is and the way it could be. Our school communities read us as dealing with the challenges of the enterprise with a commitment to the bigger picture. They do not see us as rejoicing when on the top of the mountain and being in the doldrums when the school is in the valley. Strategic Direction. When Joanna Macy and Chris Johnstone wrote their book, Active Hope: How to Face the Mess We’re in Without Going Crazy, they offered an approach to hope that was a reaction against the apathy and despair we all feel when we are in a mess. Enrollment is low. Budget is tight. Campaign is not hitting the financial targets. There are tensions between the principal and the board chair. These are the realities of organizational life and they can easily put us in a place where we feel victimized by circumstances. Neither the absence of hope nor cheerleading hope bring about strategic change. If in the presence of challenges the leader and the community root themselves in apathy and despair, there is no hope and change is impossible. A similar outcome will occur if the leader embarks on a program of cheerleading, a kind of happy-clappy optimism that tries to jolly people along. This kind of superficiality does not move people into hope but entrenches them in inertia. Identify what we hope for. Take steps to move in that direction. For many people hope is the absence of problems but this formulation of strategic direction starts with seeing things as they are. It may well be that there are obstacles that feel overwhelming but only then can we dream about what we hope for. It is in this juxtaposition of seeing things as they are and identifying what we hope for that we can actually take steps to move ahead and execute on active hope. This kind of hope is not transitory, illusory, or unattainable because it is found in the very character of God. The triune God embodies hope and offers it to us not only as a balm in difficult circumstances, but as something that can overflow within us and provide a perspective on both the present and future because we know there is more going on in our schools than we can see with our eyes. 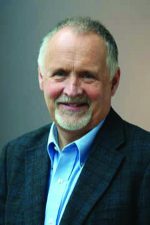 Rod Wilson, recently retired president of Regent College, UBC, has worked in the so-called secular world as a psychologist, the church world as a pastor and the academic world as a professor, Dean of Students, Academic Dean, Vice-President, and President. Rod has a Master’s degree in Clinical-Counselling Psychology, a Master’s degree in Theology, a PhD in Clinical-Counselling Psychology and an Honorary Doctorate of Divinity.